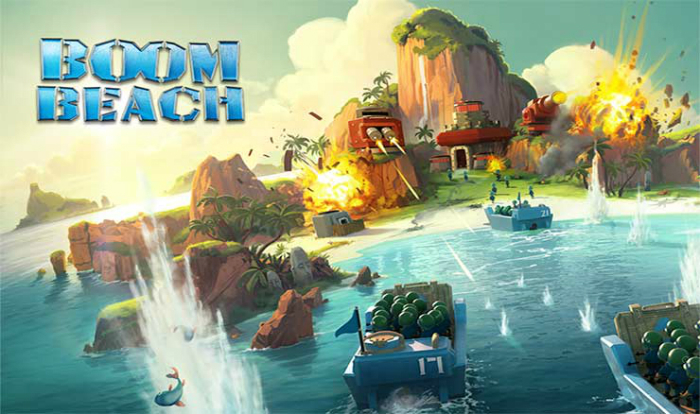 Following on the heels of Clash of Clans, Boom Beach is emerging as Supercell’s next big game. The marketing is there. “That’s some good attacking, Johnson.” Naturally, Johnson is a pile of ash after the attack, but hey, A for effort. If you’re a Clash of Clans fan, as I am, you may notice that Boom Beach is like the instrumental version of Supercell’s predecessor. It’s bright and cheery landscapes, blue skies and vibrant foliage only add to the stimulation of the game. And considering February is about as bleak as it gets, that’s just good game design. The game play is, if you can believe it, more linear than Clash of Clans. It’s almost as if Supercell plagiarizes itself by releasing this game. But that’s the best part of it, actually. I watched the Boom Cannon commercial half a dozen times before I recognized the Supercell logo at the end. Then I just had to download it. I mean, one doesn’t just simply engage in three clan wars a week and then not want to play the next game. What’s the biggest difference between Boom Beach and Clash of Clans? The cop out answer would be to write about the mechanics of the wars, but in earnest, it’s really the amount of times you need to play it in a given day. Like all worthwhile games, you’ll simply want to play it a lot. But I find myself needing to play at weird intervals throughout the day to upgrade a building or attack an island. With Clash of Clans, you have a shield, but with Boom Beach, you may need to wait for resources to collect. Which in the end doesn’t sound very different at all, but it plays differently. And if that’s the negative I’m ascribing it, then let’s just call a spade a spade: Boom Beach is a game we love.